The Bear Lake Cruise is one 51-mile lap of Bear Lake in northern Utah and southern Idaho. The preferred direction is clockwise, such that the rider remains on the lakeside of the road. 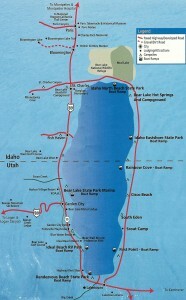 The ride uses US 89 and SR 30 on the western side of the lake, and Eastshore Road (in Idaho) and North Cisco Drive and East Cisco Drive (in Utah) on the eastern side. Contrary to what many maps indicate, all of the roads on the east side of the lake are paved. The lap around the lake is relatively flat, except for a few rolling hills along the northerly stretches of the east side. The elevation ranges from 5,927 feet along North Beach to 6,040 feet adjacent Indian Creek, on the east side of the lake. Pavement is smooth on the west and south sides of the lake, and fair on the north and east sides of the lake. Start at Garden City Park, 450 South Bear Lake Boulevard, Garden City, 0.5 mile south of the junction between US 89 and SR 30. Start your ride early during the summer months to avoid traffic on US 89. To avoid traffic, the best times of year to ride are before Memorial Day and after Labor Day. Most drivers will arrive at the lake from the southwest, via US 89. From I-15 north, exit toward Logan via US 89/US 91. Traverse Sardine Canyon to enter the Cache Valley. The highway heads directly into the heart of Logan. After making a right turn at 400 North to continue on US 89, head northeast into Logan Canyon. It is about 40 miles to the lake from here. The Logan Canyon drive ascends to the Bear Lake Summit (elevation 7,800 feet) before making a twisting descent to Bear Lake. While the lake roads will generally be clear (of snow) year-round, getting to the lake from the southwest, along US 89 through Logan Canyon, may be a challenge during and following winter storms. 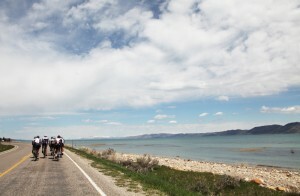 Approximately half of the ride is in Idaho, in aptly named Bear Lake County. North of Garden City, you will pass through the settlements of Lakota. There are plenty of unobscured lake views, and it can be windy at times. When you reach St. Charles (Idaho, population 128 in 2008), you are at the northern edge of the lake. The Gutzon Borglum Monument (sculptor of the presidential faces at Black Hills, South Dakota) is on the left at mile 11.8. Turn right onto North Beach Road at mile 13.5. Excerpted from Road Biking Utah (Falcon Guides), written by avid cyclist Wayne Cottrell. Road Biking Utah features descriptions of 40 road bike rides in Utah. The ride lengths range from 14 to 106 miles, and the book’s coverage is statewide: from Wendover to Vernal, and from Bear Lake to St. George to Bluff. Each ride description features information about the suggested start-finish location, length, mileposts, terrain, traffic conditions and, most importantly, sights. The text is rich in detail about each route, including history, folklore, flora, fauna and, of course, scenery. One Response to "Bear Lake Cruise"